If they Rockies came out tonight, played nine innings of sharp, focused baseball, beat the Dodgers soundly, and finally won a damn road series. Never want to see a guy get banged up like CarGo last night (at least he's okay), but the day off (regardless of injury status) probably couldn't come at a better time. That said, I'm never thrilled when EY is playing the outfield. Just don't like the idea. He seems to really be comfortable at 2B, I'd like him to stay there and know that's where he's playing. For the third straight game, the Dodgers lineup actually gets worse. The Rockies have to win this game just for the sake of pride. A road win in Los Angeles. A road, win, in Los Angeles, when the Rockies didn't even play a perfect game. A sign of good things to come, or a sign of how far the Dodgers have fallen over the past six weeks? I'll allow you to make your own determinations. All I know is a win is a win, and the Rockies don't get near enough of those under the circumstances which they played tonight. This game featured a high level of wackiness. It wasn't pretty. In fact, there were some baseball coaches in Williamsport, PA preparing for a Little League tournament this weekend that made their kids turn off the television. I'll shy away from focusing on that. Well, normally I wouldn't, but since we're pushing 2 AM here, and we're a little emotional over the release of Brad Hawpe, I'll just keep this short, sweet, and positive. Jason Hammel -- Quality outing. Continues to do an amazing job of keeping his team in games, he just isn't getting wins to show for it. Oh well, his strong work is appreciated. Huston Street -- Back on the horse with a save. Shaky? To a degree, but it's not like not the Dodgers killed him. 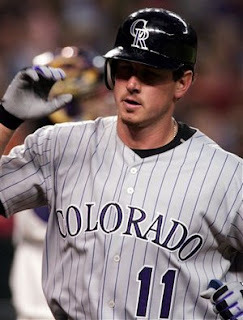 The bloop single that nearly tied the game would have been an easy flyout 100 times out of 100 with Scott Podsednik batting, but the Rockies were in extreme no doubles mode, and the ball dropped. He should be fine in a couple days. Just a bruise. Brad Hawpe -- Again, thanks for the contributions. Brad went out the way you'd expect him too, with a basehit. Eric Young -- Web Gem. Rockies will try to win a series in LA for the first time ever... or at least a really long time. Everybody get rested up and ready for some more late night action. Brad Hawpe has been officially released by the Colorado Rockies. The saddest day for me as a Colorado Rockies fan was the day Dante Bichette was traded to Cincinnati for Stan Belinda and Jeffrey Hammonds in October 1999. Dante was my guy. My favorite player. That guy whose at-bats I would study endlessly in hopes of extending my playing time in Little League and then high school. His ABs weren't just ABs for me, they were events. It started with that electric Sledgehammer walk-up, the crowd would eat it up, and it usually ended with a clutch knock or at the very least a lengthy two strike battle that wore out an opposing pitcher. I'm sure Brad Hawpe had a similar impact on a number of young Rockies fans during his 6+ year stint with the big league squad. I sympathize with those fans and all the others feeling sadness over this development. It's never fun when something like this happens, because we become quite attached to them as ballplayers, and more so them as people. it also means either the player has outgrown the Rockies, regressed, or the team has regressed to the point that it's necessary to reshuffle the deck. In this case it's actually a lot of the latter two. Regression on both sides. Ultimately I love the Rockies more any one single player, so while this is a difficult pill to swallow, I view this as a positive. Hawpe's time here was complete one way or the other. This allows him to move on, make a fresh start, play the game he loves to play. This also allows the Rockies to move on and learn more about themselves and their future. It's absolutely the right thing to do for all parties. I send out my most appreciative thank you to Brad for his contributions to the Rockies dating back to 2004. He really peaked as a solid player in 2007, was a HUGE part of that run to the World Series, and always seemed to be a stand up guy and a willing and unselfish teammate. A man's man. A winning type of athlete. A winning type of person, who has handled the situation with the utmost class and dignity. The Rockies have also handled their end of a difficult situation with class, and that makes me proud to be a fan of this organization. All the best to Brad and his family as he begins the net phase of his career. I'm sure we'll be seeing him at Coors Field again sooner than later, one way or another.